a. ^ 20,770 is Israel within the Green Line. 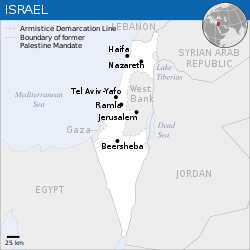 22,072 includes the annexed Golan Heights and East Jerusalem. ↑ "Population, by Population Group" (PDF). Israel Central Bureau of Statistics. 2016. Retrieved 19 May 2016. ↑ 4.0 4.1 4.2 4.3 "Report for Selected Countries and Subjects". International Monetary Fund. April 2016. Retrieved 16 April 2016.